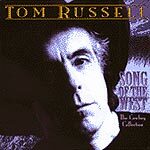 CD review: "Song of the West"
Tom Russell is invisible on the pop culture radar screen. He plays small clubs that hold a couple hundred. His CDS sell in the thousands, not millions. And when he's on the radio at all, it's likely on a college or public radio station. Too bad. For Russell is in very rare company as a songwriter; he's as good a composer as country has ever produced  up there with Hank Williams Sr., Johnny Cash, Waylon Jennings or Willie Nelson. Like the better-known artists above, Russell tells stories about losers  the women and men who fall through the cracks, whose dreams have dried and crumbled. Sixty-year-old day laborers. Fifty-ish hookers. Tired cowboys and old-beyond-their-years truck-stop waitresses. Real people who populate the American landscape. Hemingway used to write about them, but then he went and blew his brains out. Faulkner knew them, too, as did Gertrude Stein, but they're all dead and contemporary novelists write about perky lawyers with blow-dried hair and other beautiful people  so those of us with a bent toward reality are left with Russell and his few peers. Russell's latest album is one of his best; each song a little gem, drawn from the Southwest, with a strong Mexican influence that has grown stronger over his career. His deep, sonorous voice is reminiscent of Cash's, and longtime partner Andrew Hardin's acoustic guitar is beautiful, stark. If you've not heard of Russell, you've cheated yourself  life's too short to go through without listening to one of this country's best songwriters.